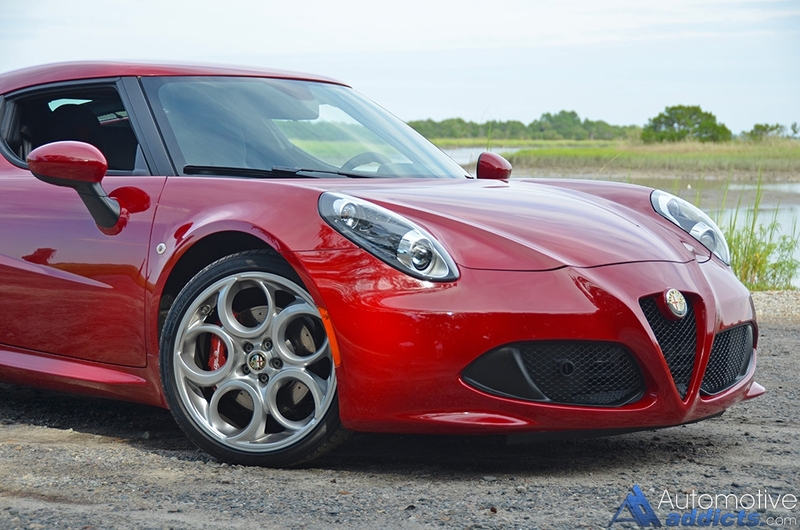 Alfa Romeo, with its lively Italian flare and unique design, is back in the states after escaping from this side of the pond nearly 20 years ago. Taking its proper place under FCA’s (Fiat Chrysler Automobiles) umbrella, the Alfa Brand gets its jumpstart in the form of the new 4C, a carbon fiber derived, low-slung, and relatively affordable exotic for those that dare to live beyond the boundaries of normality. 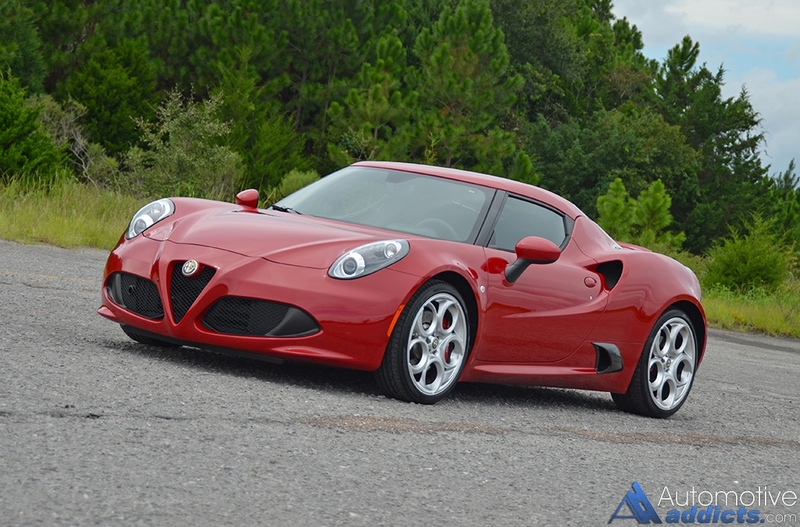 Starting with the 2015 Alfa Romeo 4C’s smallish but eager 1.7-liter turbocharged 4-cylinder engine, this scanty Italian exotic is quite the heart-fluttering machine. While on paper the miniscule 237 horsepower at 6,000 rpm and 258 lb-ft of torque at a low 2,000 rpm does its job without fail to send a light 2,400 pounds to 60 mph in just 4.1 seconds using a launch control feature. Doing the duties of sending its progressive but smooth power to the rear wheels is at the hands of a 6-speed dry twin-clutch automated manual transmission. The transmission is snappy and just as brash as the clattering and buzzing turbo 4-cylinder engine. 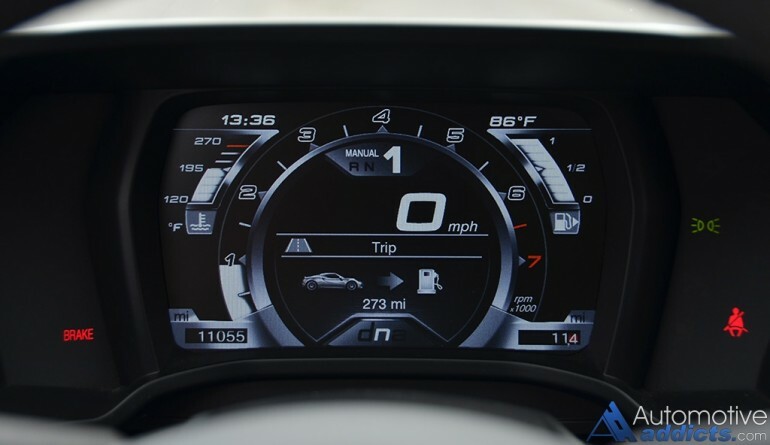 It features an automatic mode to take care of the shifting for you, or a manual mode for use of the flat-bottom steering wheel’s paddle shifters. The transmission completes upshifts in a matter of milliseconds giving way to the thunders claps of the wastgate, singing turbo spools, and a faint whisk of the blow-off valve releasing pressure upon deceleration. 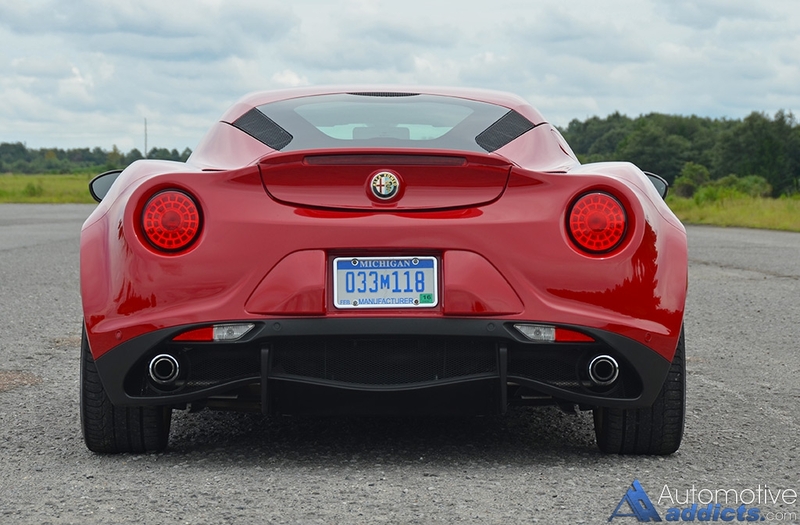 The ear titillation is beyond just about anything else on the road thanks to the 4C’s lack of a real muffler leaving the slightly resonated sound through two exhaust pipes out back to pulsate into the cabin without any filters. There’s something to say about an instant smile on the face of anyone who drives or rides in the 4C. Smiles abound as the jet-sound of the turbo fills your ears while a surge of power transmits to the rear wheels awaiting the clashing of the turbo’s wastegate and momentary close of the throttle body. Glancing through the rearview mirror as objects become distant sights raises eye brows as you see the engine rocking at the mercy of its mounts. The 4C isn’t shy about anything it does with its clamorous putter being a constant reminder that you’re in a race car for the road even if you aren’t near full throttle. 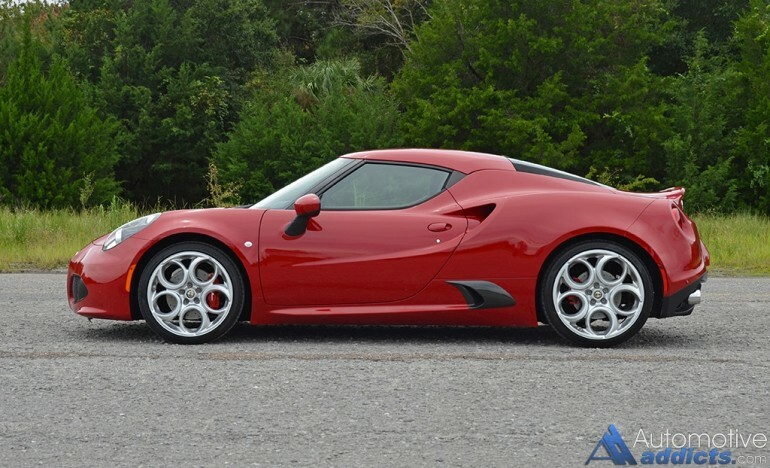 The purpose-built attitude of the Alfa Romeo 4C puts it in a category of its own; brushing shoulders with exotics that cost two or three times as much. With its small displacement and modest power output numbers, the turbo 4-cylinder engine of the 4C is a remarkable work of engineering. 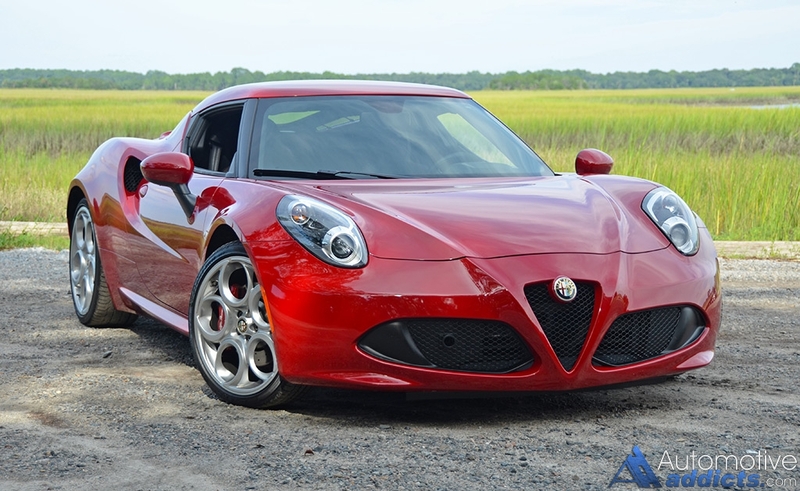 As you know, it doesn’t take that much power to rocket just over 2,400 pounds to whatever desired speed under the 4C’s 160 mph limit. Power delivery is smooth and the thrust of torque ensues the instant the turbo quickly spools at low rpms thanks to its ability to “scavenge” boost through an excess valve overlap. Essentially, the 1.7-liter turbo 4, a derivative of the Alfa Romeo Giulietta 1.7-liter. 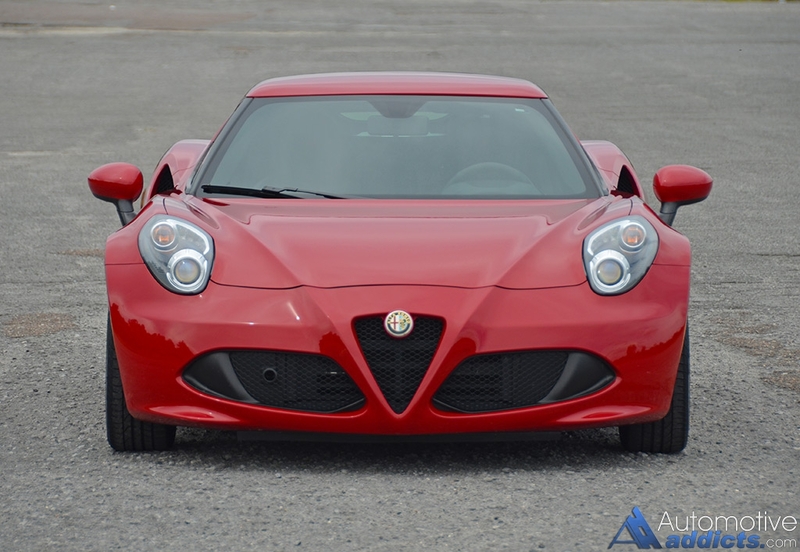 The major difference lies with the 4C’s reworked engine that keeps an additional amount of air flowing at low rpms so it is able to quickly achieve just over 21 pounds of boost at its peak. Power is never lost from that peak on up to redline at 6,500 rpm. At times you seem to run out of gearing through first and second considering how fast the engine revs through the bands giving you a little kick in the rear. 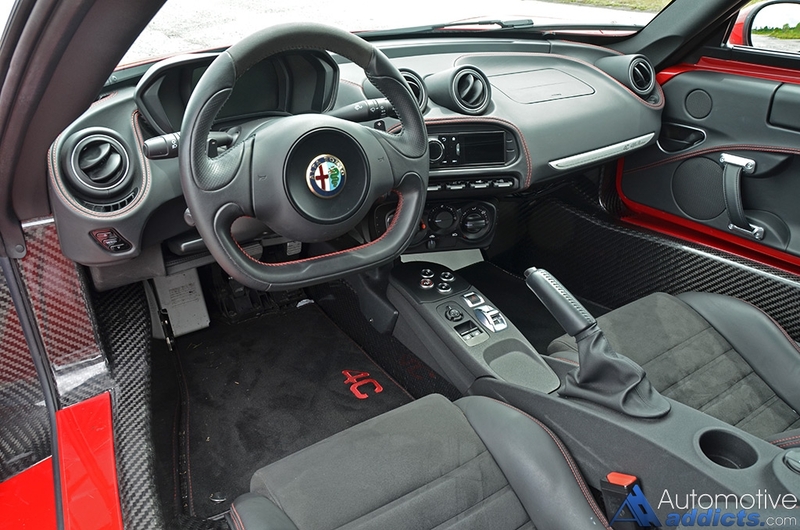 The mid-engine designation and smallish proportions of the Alfa Romeo 4C combine a purpose-built cabin with its nearly ground scrubbing monocoque tub composed of carbon fiber. The rigidity of the 4C is nearly punishing around town but thanks to a nicely tuned suspension the rigid structure and low-profile tires (205/40R18 front tires) wrapping forged 18-inch front wheels and (235/35R19 rear tires) 19-inch rear wheels, you can at least live with the ride to make it to your nearest track or autocross course for some serious fun. 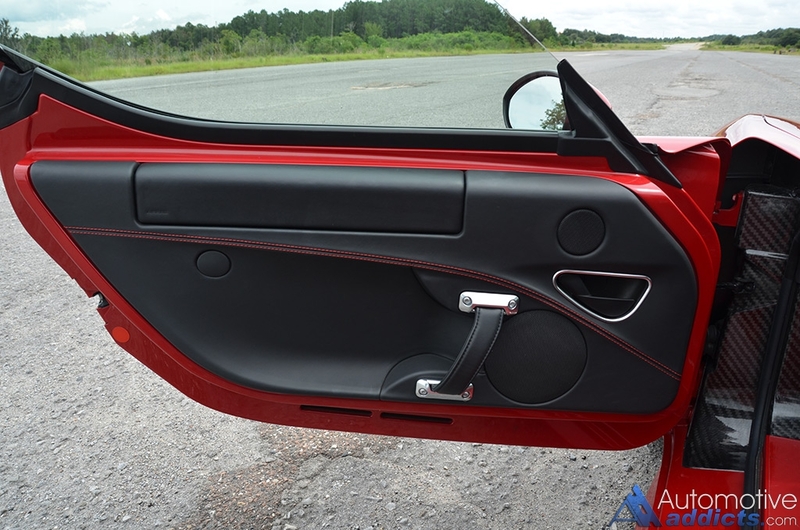 While my 4C test vehicle was equipped with the optional 18-inch wheels up front and 19-inch rear, 17-inch fronts and 18-inch rear wheels come as standard equipment. Much of the lower tub of the carbon fiber structure is left to view in its raw beauty while creature comforts aren’t part of the equation. However, there is plentiful legroom for the driver and slightly less for the passenger provided the passenger’s knees don’t receive busted caps from the protruding dashboard. As expected, due to the wide and high door sills, getting in and out of the 4C is nearly a circus act reserved for the end of the show. I will admit, even with my 6-foot 3-inch frame, I was able to dive in the 4C to find a relatively comfortable seating position – becoming closely acquainted with the thinly-layered leather and suede-inserted seat bolted directly on the floor. Practicality is completely void, as it should be in such a vehicle. Though, there is a small storage area out back from the engine with a total of 3.7 cubic feet accessed through the same glass-encased engine compartment hatch. It’s just enough for an overnight bag or two in case your passenger needs a change of clothes when they fail to hold onto their lunch after punishing them through a series of 0.98 lateral g turns. The rawness of the Alfa Romeo 4C extends beyond its exotic Italian looks finding its way into the mechanics that meet the driver’s hands. This mostly starts with the unassisted steering, which is as direct and connected as you can get. 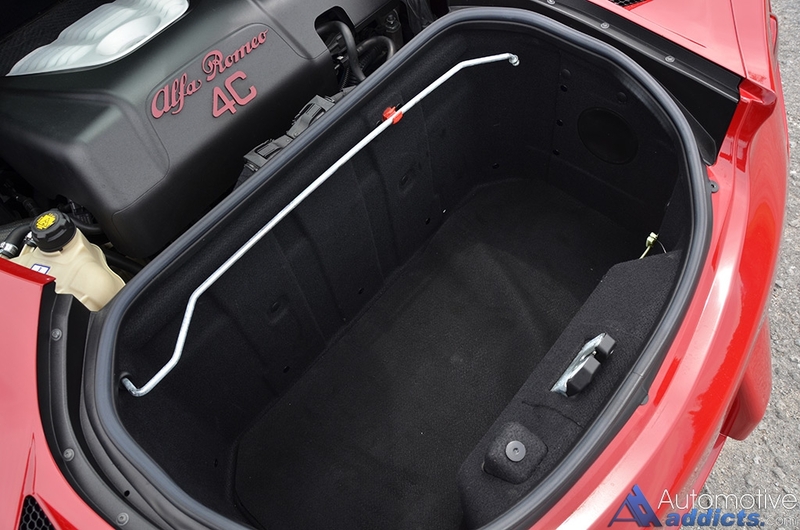 The lack of power steering proved to be a welcomed part of the 4C’s driving dynamics, with the exception of maneuvering in parking lots where a pair of strong arms is required – you’re not going shopping in the 4C! 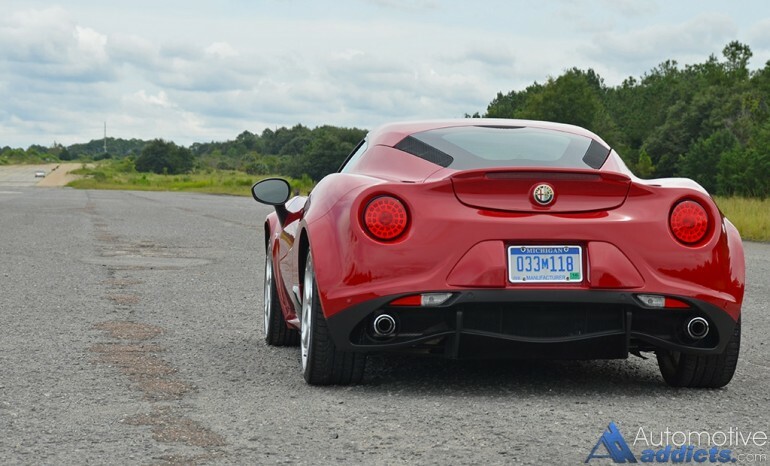 In that regard, the 4C is a proper driving machine well connected to the road much like a highly boosted shifter cart – a good looking one I might add. 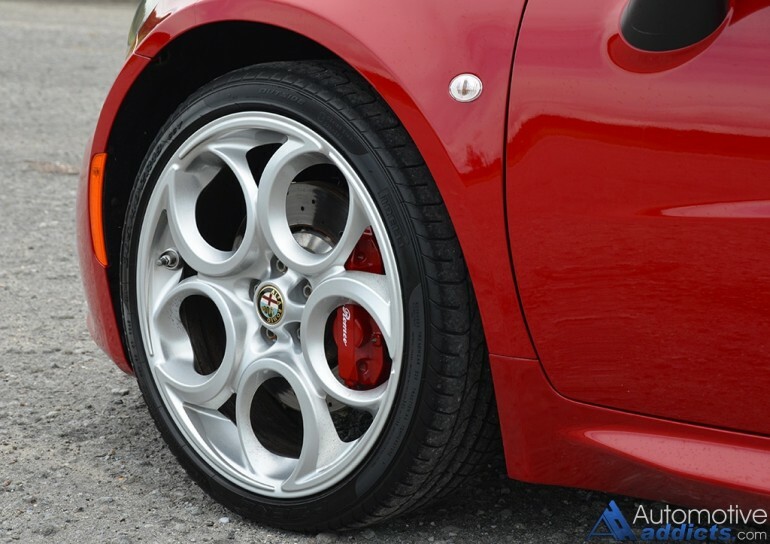 Alfa Romeo has undoubtedly created a focused vehicle that thrives on its razor sharp driving traits and ability to rack up the most smiles per mile for as long as those miles are limited to about a 100 or so for the sake of your hind parts. With an EPA estimated 28 mpg city and 34 mpg highway, the 4C is quite the fuel miser. Though, hitting those numbers is a difficult conquest considering how the 4C wants to be punished while it gratifies you with rear-end slips in its Dynamic mode, one of four “dna” vehicle dynamic settings. The dna settings (Dynamic, Natural, All-Weather) modulate throttle input, stability control and traction control. 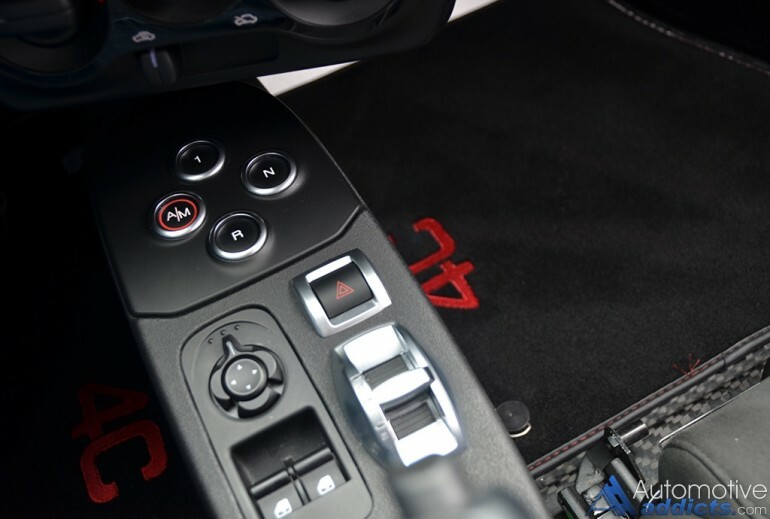 A press of the dna switch forward for several seconds after dynamic mode is selected permits racing mode where traction control is disabled and additional fun ensues. Drifting laps? Yes please! 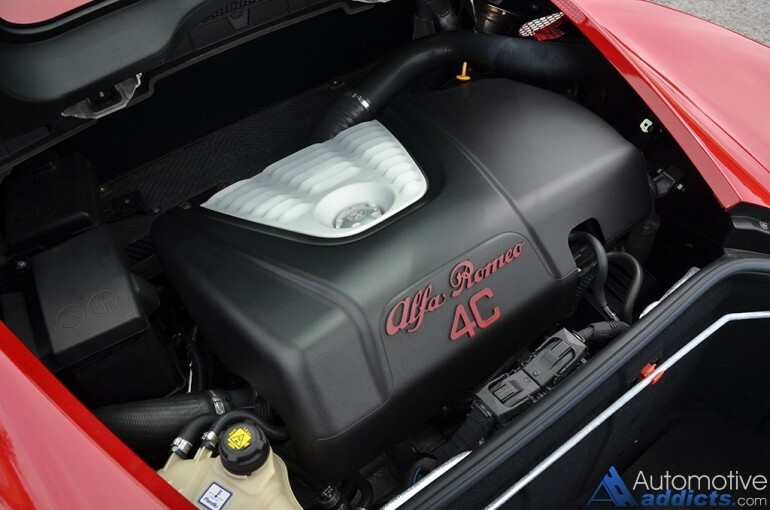 Considering that the Alfa Romeo 4C could be that special addition to your “already populated” garage, the folks at FCA make it an attractive proposition with pricing starting at just $53,900 before destination or delivery charges. 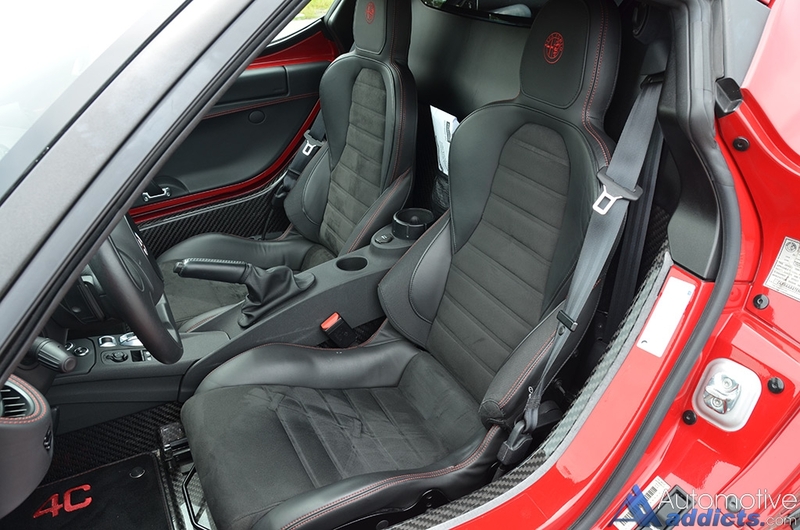 My test vehicle, with the added Convenience Group Package, Leather Interior Group Package, larger 18-inch front and 19-inch rear wheels, Red performance brake calipers, Bi-Xenon headlights, and Racing Microfiber/Leather Seats with accent stitching, came to an estimated as-tested price of just over $65,000.